It’s the most wonderful time of the year! Ah, how I love that November-December period of joy. A time full of festivals, beautiful lights and of course – WINTER FEASTS. And what would Winter be without a little bit of that big old bird, Turkey? I often here people complaining about turkey – particularly the perceived dryness of it. To that I say – learn how to cook a turkey right! Cover, baste and rest, people! Fortunately this recipe doesn’t require an entire turkey. 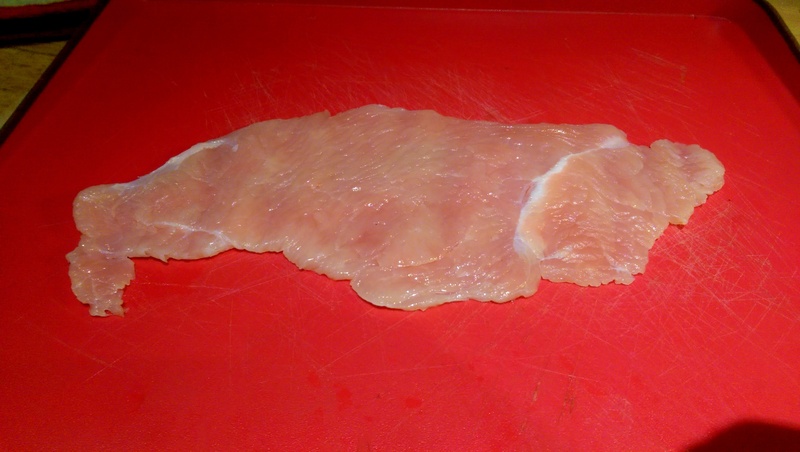 Instead, I used turkey steaks, however a butterflied breast would work just as well. So long as you have a flat, single-piece of meat that can be rolled, you’re good. I will say, however, do as I say and not as I do. This was an experiment and there were a few things I would definitely do differently next time. Wintery comfort herbs – sage/rosemary/thyme etc. Place your turkey underneath a piece of cling film and flatten with a hammer/rolling pin/saucepan. Just make it as wide and flat as you can. 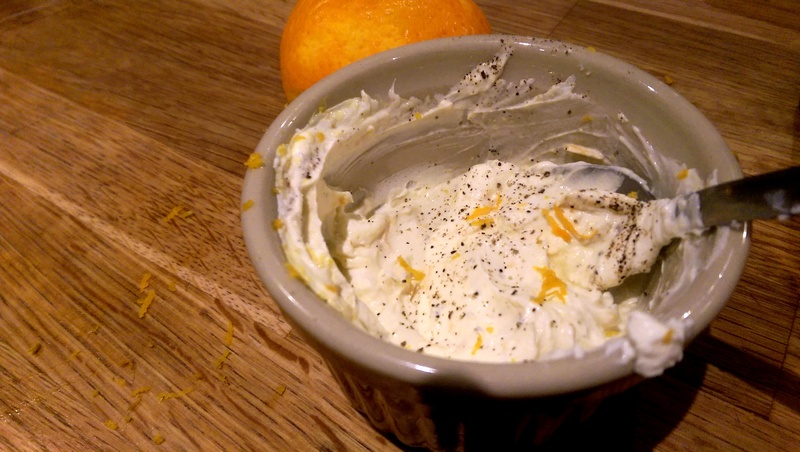 In a small bowl, mix your cream cheese with some herbs, seasoning and a small splash of fresh orange juice. I used zest but found the end result to be a tad too bitter. You don’t need much juice – just a little to add a tangy sweetness, not so much as to thin out the mixture. 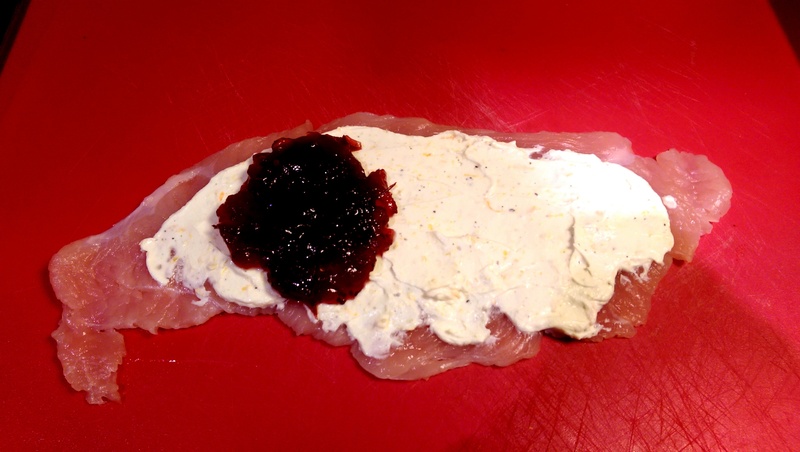 Spread the cream cheese over the turkey and put a decent splodge of cranberry sauce at one end. Carefully roll the turkey breast over itself, starting at the cranberry side. Use a gentle hand to try and stop too much squeezing out the sides. Place in a lightly oiled roasting tin. Spread over a little butter/oil and some more seasoning. 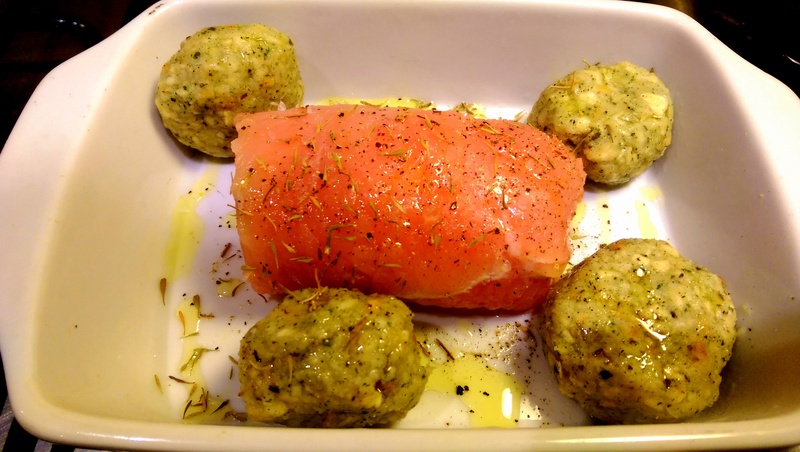 I also baked some stuffing balls in the same tray to accompany the meal. Roast until cooked through – mine took about 20 minutes. 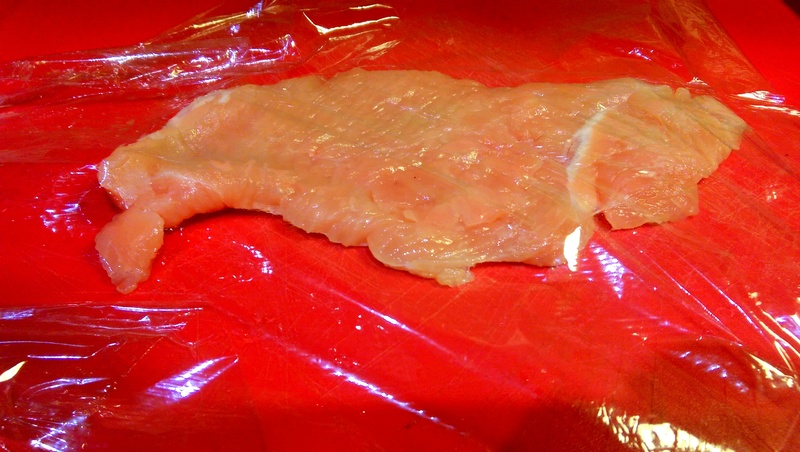 I suggest covering with foil for the first 15 minutes of this cooking time, then taking off for the last 5-10 minutes. This will help stop it drying. 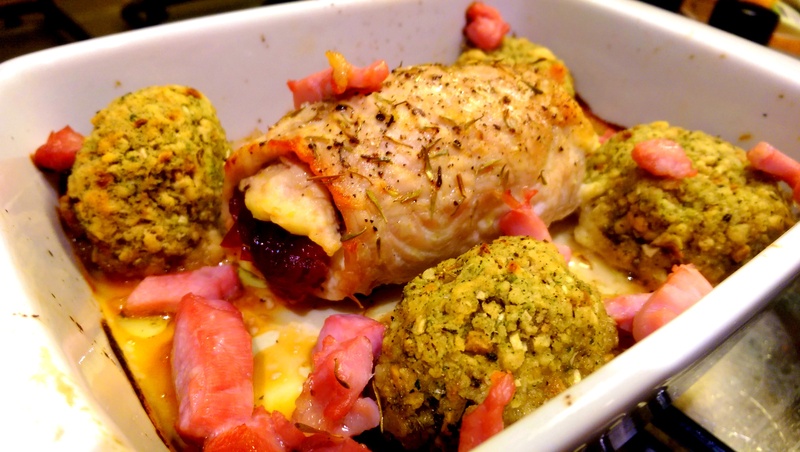 I also sprinkled over some bacon cubes towards the end, as I think bacon and turkey work brilliantly together. 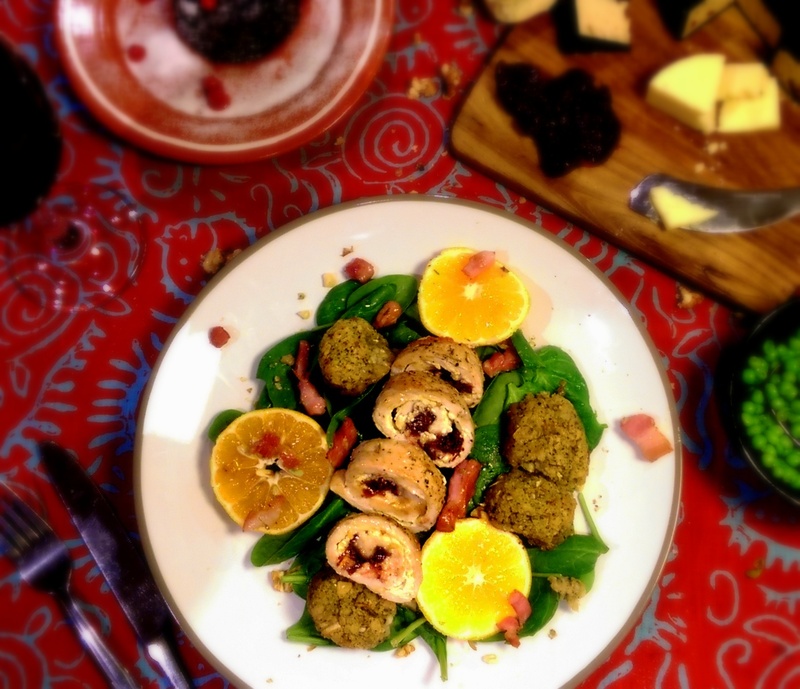 As this is a pretty rich dish, I decided to serve it over some fresh spinach along with the stuffing balls, some sliced of the orange and a nice glass of red. Posted in Guesscipes, Mains, PoultryTagged christmas, cranberry sauce, cream cheese, guesscipe, philadelphia, recipe, roast, stuffed turkey, stuffing, thanksgiving, turkey, warmer, winter foodBookmark the permalink.